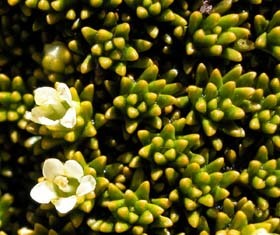 Phyllachne colensoi is a cushion plant that grows on the higher western mountains. It often occurs in relatively well drained microsites compared to the other cushion plants of this region. 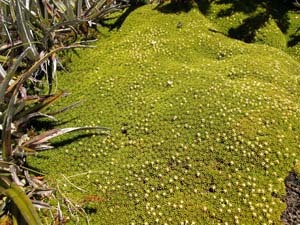 It has a distinctly yellow green colour compared to the other cushion species with narrow, spirally arranged leaves (Abrotanella forsteroiodes, Donatia novae-zelandiae and Dracophyllym minimum). Scleranthus spp. and Colobanthus spp. have yellowish foliage but have opposite leaves.